Koo Karoo Guest Lodge is situated 200km from Cape Town - which makes the journey an excellent weekend getaway. During your time here you can visit the historic Montagu Museum, enjoy some food at one of our many farm stalls or restaurants, or sample the local wine. 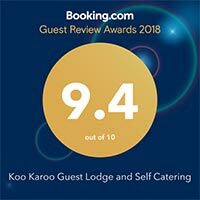 Koo Karoo Guest Lodge dates back to 1899 and a stroll around the village will introduce you to more fascinating architecture and historic buildings. For the lovers of the great outdoors there are many scenic walks, nature trails and mountain hikes and mountain biking trails in and around Montagu. We also have some of the most challenging rock-climbing in the whole of South Africa! The Avalon Springs Resort is home of the hot springs and can be experienced as a day visitor too! After a long hectic day, enjoy the peace and tranquillity with a glass of Montagu muscadel, or a wonderful dinner at one of our fine restaurants located one street away from your accommodation.